The most fun part of getting a DVD of a favorite film is watching ‘the extras.’ I love seeing the outtakes, the old trailers, and especially the deleted scenes. I don’t think watching the deleted scenes of Fantastic Beasts, however, is going to be exciting or enjoyable that way. For one thing, we know about six of them already, so the surprise is gone. And, frankly, because what they cut were scenes that Rowling wrote in her actual “original screenplay,” we’re having to see what the producer and director decided “didn’t work” as extras rather than as the story Rowling imagined and wrote it. For Rowling fans, that’s a bit like learning there was a publisher’s error at the print shop and six chapters of her novel aren’t in the hard cover edition we paid for. Posting them online for us to experience six months later and separately from the film is not giving us the story as our favorite story teller wrote it. After the jump, I’ve written up a list of the six cut scenes and the words of the film makers and actors about them (each change in color represents a change in source material; follow the embedded links for the original interviews and stories). I’ll close with the importance of two cut scenes in light of Rowling’s writing artistry and some thoughts on the other four. Enjoy! This scene saw Jacob returning to his tiny apartment after his bank loan had been rejected. Waiting there is his fiancée Mildred, who asks him if he managed to get his loan. After Jacob informs her that he didn’t, she hands him a ring and walks away. 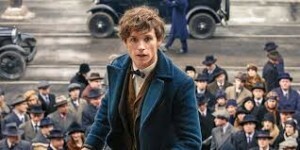 David Yates insisted that it was “the most beautiful scene, tender and very funny,” before explaining that they got rid of it because the audience “didn’t need a reason to fall in love with Jacob” thanks to Kowalski’s performance. Eddie Redmayne: “I had to flipping work out for seven months because there was a scene – which is tragically no longer in the film – in which Jo was like, ‘I want you take off his top and see that he has been bitten and has all these war wounds and, even though he looks like this, is actually ripped. David Heyman also noted that this moment came at a rather inopportune time, too, because it took place when Newt, Queenie, Tina and Jacob all go down into the briefcase. “At that point in the story, there’s a lot of stuff going on outside,” he explained, so it felt a little peculiar that all four of them had sat down to sing a song. Going back to your music, I believe there’s a scene where you sing the Ilvermorny song. Can you still remember? That was my favorite part; Katherine and I both liked that. David Yates mentioned there was a deleted scene where the girls wrote a school song. Dan: Yeah, so Alison, obviously, is a fantastic musician. They asked her to write the Ilvermorny school song. So there was a moment when they’re down in the suitcase – in the zoo – and we’re like at a little meeting of the minds. In that little respite, they sing the song because they’re trying to argue what’s better – Hogwarts or Ilvermorny. And that’s where the improve of, “I want to be a wizard,” came from. So we’re sitting there. They sing the song. Me and Eddie are sitting there clapping. And Dan Fogler – it was me [saying], “I want to be a wizard!” That’s the one from the trailer. It didn’t make it in the movie. New Musical Express: Was there anything in the script that was particularly difficult to shoot? David Yates: Actually there was. There was a really beautiful scene that [Rowling] wrote where Newt tells Tina about a young African girl that he tried to save, because this young African girl had an Obscurus. It’s a really difficult story for Newt to tell. 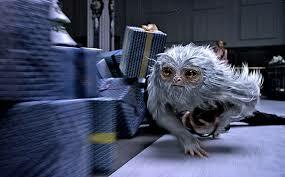 They’re in a department store, chasing the demiguise. Newt shares this story with Tina and, as he shares this story with Tina, the demiguise has a forward vision of multiple futures for Tina and Newt. They start to peel away from each other and then you see these multiple Tinas and Newts having different conversations about their future. It’s an absolutely beautiful scene on the page, and I always loved it. When we were developing it in the script, David Heyman kept saying, “That’s a tricky one there, isn’t it? How does that work conceptually? How does that not stop the film from rolling forward?” And I always said, “Look guys, it’s so beautiful” – this idea of future Newts and Tinas. It was very trippy and very fun. But, of course, when I put the movie together it just felt – in the moment – we were gaining so much momentum chasing that demiguise that it felt like it stopped things. 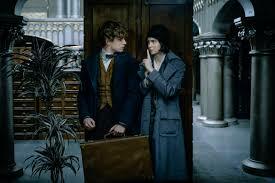 Rather than deepening Newt and Tina’s relationship, it didn’t quite take us to where we wanted to be with them. And so, we took it out. It’s a testament to Jo’s unique imagination that she comes up with stuff like that all the time. Most of the time, when we shoot it, it works – but in that case it just seemed to stop things a bit. SnitchSeeker: After watching the final cut, what were your favorite scenes? And what would you have wanted added that was deleted? Dan: Yeah, it was missing some of my favorite stuff. I still loved it. It’s incredible. One of the major bits that I missed was in the department store. All the stuff was cut for time. It’s all great stuff. And there will be some gigantic extended cover. 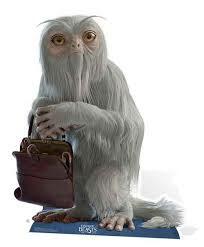 Fogler says: Jacob becomes most attached to the white–haired demiguise, Dan admits, despite it being “hard to catch because it can tell the future.” Something about Jacob’s nonthreatening nature lures to demiguise to trust him and they grow a bond, which helps them in tight and dangerous situations. SnitchSeeker: Who will be back for the sequel? David Heyman: Newt, Queenie, Jacob and Tina will be back. SnitchSeeker: I feel like David [Yates, director] mentioned that Credence will be back. David Heyman: Credence will be back, too. David Heyman revealed to me during last week’s New York press junket for Fantastic Beasts And Where To Find Them that a key scene showing Credence alive and well following his supposed death was cut from the final film. CinemaBlend: So, what was that scene kind of like? Heyman: Him getting on a boat, maybe a boat with Newt, maybe not, and heading off out of New York. David Heyman doubly confirmed that Credence will still be involved in the Fantastic Beasts And Where To Find Them franchise later on in our discussion, too. After I quizzed him about whether Newt Scamander will be at the heart of the franchise he responded by listing of all the characters that are in the follow-up, which included Credence. Heyman: I don’t think [Newt will be at] the heart of all of them. I think he’ll be part — so will Tina, Queenie and Jacob — will be part of the next one. CinemaBlend: And I’ve heard that Dumbledore has been confirmed, too. 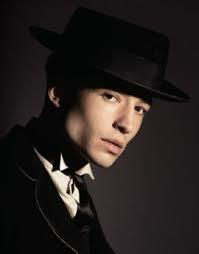 Heyman: And Credence and Grindelwald. I think they will be the main players. Two of the deleted scenes are real head scratchers because of their obvious importance to understanding the series artistry and meaning. The most obvious of the two? 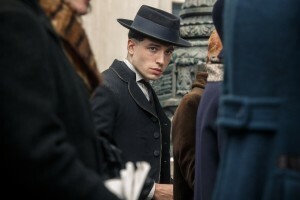 Credence’s survival. Heyman’s desire not to have what he calls an “Aahh, there we go!” moment is bizarre, even disturbing. Theater goers are left to learn that a character Heyman describes as one of the two main players in the sequel was not killed, as everyone on screen and in the cinemaplex who has not read the screenplay with a magnifying glass believes, but is alive and leaves New York. I confess to wondering, because of the suggestion below in the printed screenplay, one so subtle that it is lost in the subway scene as filmed, if Rowling did not want it filmed. As Newt follows Madam Picquery’s gaze, he sees a tendril of black matter, a small part of the Obscurus, floating down through the roof. Unnoticed by anyone else, it eventually floats up and away, trying to reconnect with the host. (The Original Screenplay, Scene 116, p 259). This in-text hint, I really cannot say it is a “revelation,” that the white light implosion that occurs during the aurors’ execution of Credence meant he somehow escaped takes place after Graves’ capture and his exchanges with the MACUSA President and Newt, his captors. If this is what Rowling meant us to have as our take-away until we meet again in 1928, Paris, she was out-doing herself in her signature “story twist.” I have to wonder how she could have kept Ezra Miller’s participation in the second film a secret. 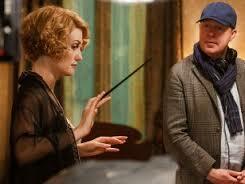 But Heyman tells us they shot the scene, which more than suggests he had a script for it as written by Rowling. That he left out this key scene, which led to its being deleted from the published ‘Original Screenplay,’ beggars belief. The several reasons for its being cut that I can come up with are all grossly uncharitable on my part which only highlights the incomprehensibility of the decision to cut the scene. “AAhh, there we go…”? If Rowling wrote the Credence exit scene and they filmed it, it should have remained in the final cut or Heyman shouldn’t have told us about it. This whole event shows David Heyman in a very poor light. The second cut scene whose omission I think is more important than the rest is Jacob Kowalski being dumped by his fiancée Mildred. We’re told she left him because he failed to get the bank loan to start his bakery. I “get” the excuse the film makers give for cutting what they describe as “the most beautiful scene, tender and funny.” If you think like a conventional filmmaker and every scene has to move along and contribute to the total experience, we don’t need the scene. You know who understands Rowling’s writing? 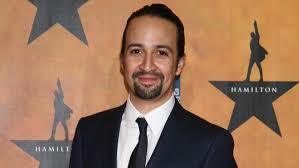 Lin Manuel Miranda. I don’t think he would have cut Mildred’s dumping Jacob from the film. In a recent Twitter exchange with The Presence, Miranda expressed his admiration for the line delivered by Dumbeldore in Half-Blood Prince: “ ‘I am not worried, Harry,’ said Dumbledore, his voice a little stronger despite the freezing water. “I am with you.’” Rowling thanked him for remembering a line and book she thinks is forgotten in the shadow of the finale, Deathly Hallows. Miranda demonstrates in his reply to Rowling’s thank you that he understands Rowling’s brilliance as a writer. “You’re deadly with a reprise, maestro.” Miranda gets that Rowling’s structural scaffolding, what to a musician is a “reprise” or lyrical echo and repetition of a melody, is what in books is called “parallelism,” chiasmus, or ring composition. 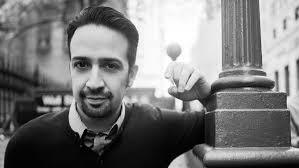 What Miranda understands about writing and story-telling as a gifted playwright and composer, filmmakers do not get. At least not these filmmakers. I’ve written at some length about the brilliant parallelisms of Fantastic Beasts 70 real scenes. One of the problems in charting the movie is that there is no parallel moment in the opening of the film to the haunting farewell at the top of the Subway Station stairwell near the end, the climactic scene in which Jacob Kowalski heroically leaves his friends and their life of magic rather than ask them to break the Statute of Secrecy. 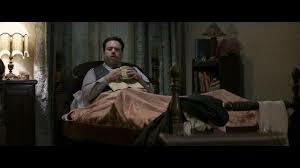 Rowling has told Dan Fogler that Jacob’s “transformation” is going to be “incredible” in the course of the series and the power of this farewell scene is clearly meant to be a marker of the No-Maj character’s importance. Which is why the scene of Mildred’s dumping him at the start is so important. It’s not redundant. It is the set-up for the story-turn, the dead center moment in the film, one seemingly unnecessary for the movie, when Jacob is left alone in the jail cell as Newt and Tina are taken to the interrogation room. The function of the story turn is to echo the opening and point to the finish. If Mildred’s scene is included, his being left by himself in jail without his friends is a clear echo. Newt’s comment that “I hope you’re able to start your bakery” echoes their meeting in the bank and points to Newt’s gift of the Occamy egg shells at the close. More importantly, it points as well to the farewell at the Subway, a reverse echo of his girlfriend’s callously leaving him because she cannot appreciate his real value, the scene in which Queenie the Legilimens shows and tells Jacob the Loser she is able to appreciate, to love him. Because he is able to do the right thing and walk away. The final scene of Queenie’s arrival in the bakery? It’s a wow – but I imagine it as the reprise, as Lin Manuel Miranda would put it, of heartless Mildred. If the scene is left in, it is an epiphany not to be forgotten. Without it? We’re just left wondering if Jacob is going to regain his memory. We miss the great inverted parallel of the first scene, a woman he loves walking out on him because he is unworthy, with the last, a woman who loves him walking in on him because he is worth risking her freedom for. That’s quite a difference. Think of Chamber of Secrets. Dobby only appears in the opening, the dead center, and final chapters. We know because of his position on the axis that his transformation in the story is emblematic of the theme of the novel, what Rowling hopes her readers are experiencing in the story, freedom from false masters and ideas. 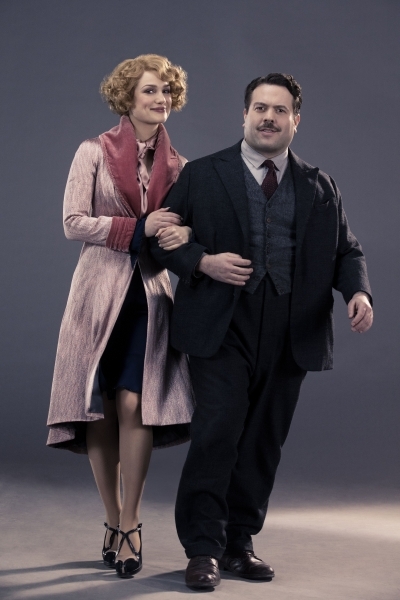 Thus Jacob Kowalski, Mildred, and Queenie on the axis of Fantastic Beasts, except we don’t get Mildred. Sort of like Chamber without Dobby dropping the pudding at the Dursleys. Very different story experience. Part of me wants to think, to believe that Rowling decided to try her hand at screen writing because she was tired of watching her brilliantly planned and executed novels laid out as mechanical, cardboard-cut-out Three Act Formula productions by Warner Brothers “professional film makers.” If that fantasy of mine has any truth in it, maybe it is reflected in Heyman’s comments about Rowling’s abilities as a screenwriter, putting aside the patronizing comments he makes about her as a beginner, that her story framing is “unconventional” in defying Three Act norms, even that it is “beast,” which is to say, I hope, challenging and courageous. I want to believe that, but then I remember the six scenes above. Beyond the two scenes discussed already, what else did the David Ducks’ cuts do to Rowling’s story? (1) Newt is cold to Jacob in the Obscurus chamber of his suitcase menagerie and warns the No-Maj away from the floating, enclosed congealed-smoke. Might the scars on his body that we do not see in the shirtless scene include the marks of his battle to capture that Obscurus over the body of the girl in the Sudan? 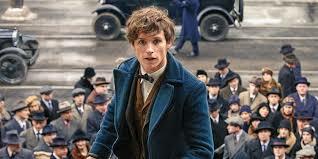 (2) Newt tells Tina about that specific adventure as they hunt for Dougal at Macy’s – but we don’t learn anything about that because that scene, with elements of their possible futures revealed by the Demiguise, Rowling’s favorite magical creature, was cut because it was too confusing, it slowed down the forward progress of the film. Because, y’know, information about the Obscurus and Obscurials that Newt has acquired isn’t essential to believing that Newt will know what to do to Obscurus Whisper Credence back to human form, why Tina will tell him to go into the subway to Credence while she delays Grindelwald in the closing battle. (3) The Ilvermorny school song is the parallel scene to the first meeting of the Fantastic Foursome in Tina and Queenie’s flat, a second dinner scene. That set-up and it’s turn at film’s center in their successful adventures in and escape from MACUSA headquarters are both wasted. Yes, we are committed to learning more about these two couples without the scene. 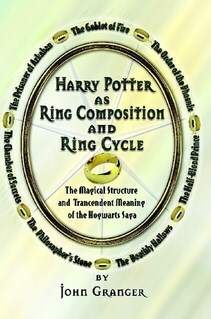 But why disregard Rowling’s ring artistry? (4) Jacob and Dougal? I’m reminded of the time the Warner Bros Looney Tune filmmakers decided that they didn’t need Kreacher in Order of the Phoenix. They planned to cut him out of the screenplay as unnecessary a CGI character as Peeves the Poltergeist. Rowling intervened because she was aware that the House-elf was essential for the events of Deathly Hallows. They cut out Dougal and Jacob’s bonding scene but not Dougal entirely. Time will tell if the Jacob-Dougal relationship is not going to be a big deal in at least one of the later films. If it is, you’ll know that the film makers’ “we know best how to tell a good story” decision was just a failure to recognize Rowling’s greater gift even in their own medium for slow narrative release and the strong reprise. Speaking of reprises, remember Heyman’s comments about the deleted scenes, his justification for the cuts? Forgive me for wishing for a producer and director whose priority is not to find a shape except the one Rowling has written. Sure they do. Except this story wasn’t a novel being adapted to the screen. It was written by the woman who has largely re-set the standards of what can be done by authors for readers of novels. I place it before you for your consideration that her “mistakes” as a new screenwriter are almost certainly more interesting and reflective of a greater understanding of story than the producer and director, heads together, are likely to achieve on their best days. Her story shape, the ring with its lyrical reprises and internal echoing, is the shape of revealed scripture around the world, epic poetry, folk tales, The Chronicles of Narnia, The Hobbit, and too many others to list here. Anthropologist Mary Douglas argues it is the universal story form for which human beings seem to be hard wired. J. K. Rowling’s success with this narrative scaffolding in Harry Potter, the individual novels as well as the series, is evidence both of Douglas’ theory and of Rowling’s mastery. If I had my druthers, I’d take my chances, then, with Rowling’s traditional story telling, her “beast” ring-writing, over the formulaic conventions of Heyman, Yates, and Kloves. I know hoping that she will someday have ‘final cut’ veto power is like waiting for pigs to fly, but in a year of Brexit, Trump, and a Cubs World Series win, why not? The impossible sometimes happens; this year it happened at least once, sometimes twice, in every quarter. Thanks for reading. Please tell me what you think of the decision to cut these six scenes and what their absence did to our experience of Rowling’s story as she wrote it in the comment boxes below! Part 4 in this series on the other revelations about the real “original screenplay” is coming your way; stay tuned! Ah ha! So it was a spell and not Polyjuice. What’s-his-name hasn’t read the book, is that it? Also, the escape of the fragment of Obscurial is a clumsy quote of the very end of the first Star Wars movie, which at the time was a clear statement that Darth Vader has escaped and so there will be a sequel. 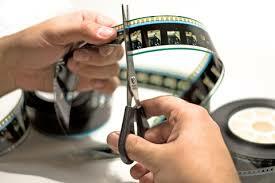 Film makers like conventional shorthand devices like that. It’s too bad that working “pros” don’t have time to learn more about their jobs. In a previous post, you said you didn’t have a problem with scenes left out of the HP movies because you had the details in the books. I always had a disappointment in the movies because I felt some of these were crucial to the story. Knowing that keys were left out of this movie, frustrates me. The average viewer will not ever know these details nor be able to experience some of those “aha” or links that enrich the story and the experience to make it a Rowling trademark. I am a nerd and have been combing fansites, twitter etc to find any of these missing details. Heyman’s comments about Credence on a boat maybe or maybe not with Newt were irritating. He knows and is not telling. Does he think people won’t go see the movie if they know that piece of information? 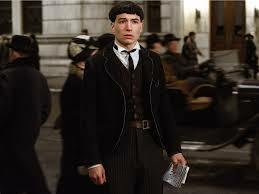 Fans were outraged Credence didn’t survive and may avoid the next movie because they believe Credence is dead. If they knew he survived, they would be really excited to see what happens to him. So, I think he cut off his foot in deleting that scene and then misleading us. many people of various ages and nationalities worldwide? They should take heed and try to capture this in the film structure even though it doesn’t fit their idea of filmmaking. Her books were successful because of this. Who are they tothink this wouldn’t or couldn’t translate into the screen. Oh, by the way, I heard about another deleted scene that you didn’t include – maybe because it hasn’t come up in interviews and isnot confirmed. Credence and Graves/Grindelwald are in a diner. Graves says something about Credence ordering what he liked before. Then, he transforms or creates a specific flower on the table. I can’t remember the name but it was some type of magical flower. Knowing JKR, if this indeed was part of the story, you have to know that flower and it’s name had some sort of significance. The diner scene was filmed according to a Pottermore correspondent. She described her day as an extra on the set. She was at another table in the diner. She doesn’t go into details on Pottermore so the actual details must have come from somewhere else. I’ll keep looking to see if I can find a source. As you say, no details. But a missing scene which makes Seven, the magical number! Well, “director’s cuts” have been made of plenty of films, although they are not always considered an improvement (See the “Han shot first” movement.) If Fantastic Beasts does even a fraction as well as the Harry Potter films, JKR certainly has the clout to be the first to release a “screenwriter’s cut” If the studio thinks they can make money on it, it will likely happen. I know, I’m dreaming— it is Christmas Eve, after all. Louise M. Freeman, I’d like to add to the Christmas Eve dreaming. Warner Brothers has done what JKR’s films need – once – in 1965. Tonight my wife and I watched the “Remastered Deluxe Edition” (2008) DVD of A Charlie Brown Christmas. The DVD featurette A Christmas Miracle: The Making of A Charlie Brown Christmas is everything we’ve been talking about on the blog about how the Newt film is good but how it could have easily been so much better. *All* it took was for everyone involved to go with the author’s proven ability to tell a story. 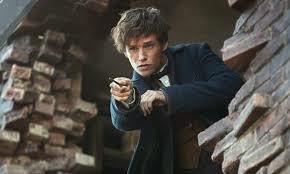 I`m really grateful that you`ve gathered all this information about Fantastic Beasts and its making in one place. Maybe JKR will eventually publish an “extended screenplay“ which includes the deleted scenes. I did kind of appreciate having a screenplay that was more or less the same as the film because it helped me see what Rowling`s ideas were that underpinned the film we saw (rather than a different film entirely that we did not see.) It`s clear from the script, for example, that Graves is battling with a wand more powerful than that of any of his adversaries…because it`s the Elder wand. I liked your speculations in your other article about Newt`s mission to trail (and capture?) Grindelwald. Newt manages to subdue Grindelwald with some kind of spell that binds his arms so he can`t use his wand…and this unorthodox approach suggests Newt knew, or deduced, that Graves was Grindelwald and that he had the Elder Wand. Hmm. The story of what was going on behind the New York story would be pretty interesting. I wonder if we`ll get bits of it in future films. Yes, this makes perfect sense to me, all that you say. 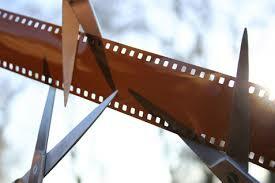 It also explains why I could not grasp the shape of the film – there seemed so many holes. I had been so immersed in chiasmi and ring structures myself that the film seemed loose and vague. British TV is re-showing the HP film series (I avoid ‘franchise’, it smacks of the opportunism you are scathing about in the film making) over Xmas, and I must say they re-confirm my own doubts about the screenwriters’ and directors’ decisions also. I suspect JKR is now struggling to wrest some story-structure back into the follow-up series of Fantastic Beasts; a really unnecessary aggravation and amount of work. Just stumbled upon this website, what fun! Agree with thoughts on deleted scenes, they all would have contributed and/or might contribute in the future. (And even if not, we would have loved to see them!) And JKR by now has more than proved her excellent skills, so they should trust her understanding how a story is best unfolded. What I believe Heyman was trying to say is with the “Ahh, there we go” is that he maybe felt that having too many setups for the next movie was overdone (by Marvel, for example). I personally liked his arc more with him dying, though the idea of having a little wisp float away in the background would’ve been a cool touch too. “it is lost in the subway scene as filmed, if Rowling did not want it filmed.” You mean AS if she didn’t want it filmed? ” Grindelwald’s “Will we die, just a little?” makes seem transparently clear. ” What does this sentence mean and what does it have to do with Credence? You need the full sentences. No, it still doesn’t make much sense, even in context. I have cut that confusing sentence out and added a “below” after “suggestion” in the first sentence. Thank you for the editorial assistance — and for making me revisit this post about the first film (I learned how much I have forgotten about the butchery of the first film editing! ).